Our Federal and State Constitutions worktext is perfect for the home school curriculum. Homeschooled students of all ages can benefit from this concise and easy-to-read worktext. This worktext is a great way for parents or other homeschooling instructors to approach teaching the Constitution without having to worry about compiling new materials or finding an effective way to present the concepts of the Constitution; Our Federal and State Constitutions is a proven method. Or, it can also be easily adapted and combined with any current techniques you may have of teaching the Constitution. 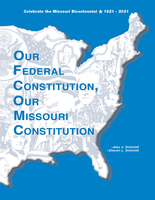 There are many resources that can be used as Constitution Day Materials (September 17th). It also makes a great constitution test study guide! Click here to go to our worktext catalog page. Our materials can be used by home schooled students in all states, covering not only the federal constitution but also the state constitution. 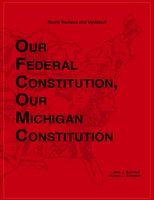 State specific editions are available for the states of Illinois, Pennsylvania, California, Ohio, Wisconsin, Michigan, Missouri, Washington, New Jersey, New York, and Indiana. 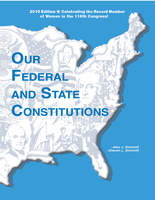 We also offer a comprehensive "Universal" edition that covers the remaining state constitutions. We also offer a variety of useful materials to accompany worktext learning. State and Federal Constitution Review Testing Programs are great for homeschool students with home computers, and are excellent for testing over the materials presented in the worktext. Students can also benefit from our U.S. Constitution Card Game, a fun and interactive game that students can play with parents, siblings, friends, and anyone else who wants to challenge their knowledge of the Constitution. Also, our "Constitution in Plain English" poster is a beautiful addition to the wall of any home school student's room, or to any room in the house! Check out our catalog of Accompanying Materials for more information.